Getting pregnant the first time wasn’t as easy as I thought it would be. After 18 months of trying, I went in for infertility services. Everything came back “normal”. We ultimately ended up doing intrauterine insemination, which is another bizarre story. The provider didn’t seem hopeful and quickly prescribed meds that she wanted me to start taking if I didn’t conceive. The chances of getting pregnant through IUI is low the first round but your chances improve the more cycles you do. We compromised on a hospital birth with no doula because he said he would be my labor support and didn’t want the expense. I agreed but told him if it didn’t go well then next time I would do it my way. Before I got pregnant I had gone to several midwives for my yearly physical, searching for the one I’d want as my birth provider. I initially chose one I liked and that was close to my office. After our 1st or 2nd appointment I knew she wasn’t the one for me because I asked her if she had any doula recommendations and she said she couldn’t remember the last time she attended a birth where a doula was present. I switched to a midwife that I really liked because I thought she was relatable and proactive because she had a blog. I told her from the beginning that I wanted an unmedicated, vaginal birth when the baby chose to come. Towards the end, I asked her if she birthed unmedicated and she had not. I thought that would make a difference in the type of support she could offer me. A week before my due date she asked me when I’d like to be induced. WHAT!!?? All this time I had been clear with her about what I wanted. She continued to suggest some form of induction and I let her sweep my membranes twice. That was one thing I didn’t research and looking back I wish I would have never let her do that. To me, that is a disruption to the natural progression of birth. Four days after my due date I was dilated to a 3 when she asked me when I wanted to schedule my induction. I told her I wanted the weekend to see if I would go into labor naturally. Thankfully my contractions started on their own. I knew I needed to stay at home as long as possible. I definitely had a fear of the hospital putting time constraints on me. I labored Friday evening and Saturday before I felt like the pain was quite strong and I should be ready. When we arrived at the hospital they checked and I was still at a 3. The nurses said they could monitor me for an hour and if I didn’t progress then I should go home. I remember crying because the nurses were so nice, not pushy like I imagined. I continued to dilate so they checked me in around 6 PM. 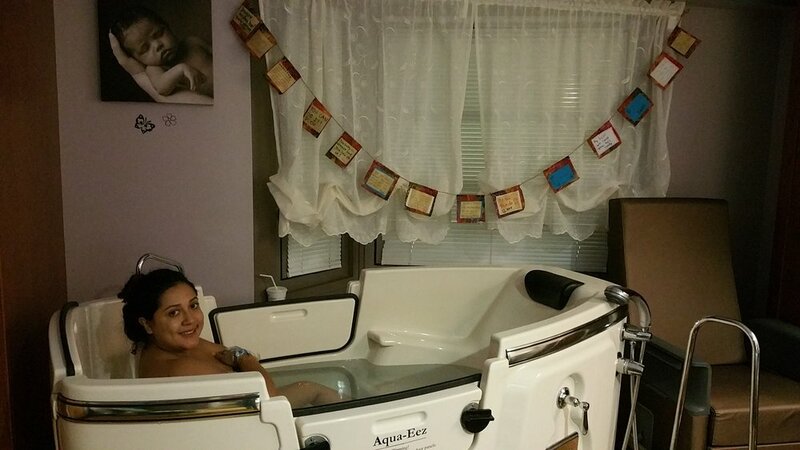 McKay Dee Hospital has a birth room specifically for mothers who wish to go unmedicated, with a tub to labor in. I adorned my space with the birth affirmation banner that was made at my baby shower and hung a photo of Sylvia Ji’s female Warchief on my door. My midwife arrived and I remember thinking how nice it was that she spent quite a bit of time supporting me through labor. She would do counter pressure on my back, which didn’t feel good, but I didn’t speak up because I thought maybe somehow she knew better and that it would help. I dilated to a 7 and stayed there for a while, all normal, but my midwife said I wasn’t progressing anymore. She kept taking her fingers inside me trying to stretch my cervix. Absolutely invasive but I trusted her. Looking back I should have told her to get out of me. She was convinced I was not going to progress past a 7. She suggested Pitocin. I knew this decision would result in unnaturally painful contractions, but I agreed. Time went on with no progression, but now looking back at the timeline, it wasn’t even that much time. Then came her suggestion for a c-section, reasons being I was almost 41 weeks and my placenta was old and not delivering sufficient nutrients to my baby. I told her, no, and to give us time to talk about it. I feel angry towards her, but I’m also mad at myself because I knew better. I had only been in the hospital for 7 hours, maybe she was getting tired of waiting. If only I had a doula. I was exhausted and of course, a provider telling you you’re putting your baby in danger with an old placenta gets to you. Like I said, I put the time into being educated but I skipped the section about cesarean delivery because it wasn't going to happen to me. I agreed but asked if I could have skin-to-skin contact right away and if my husband could cut the umbilical cord. Of course, she said yes, but none of that happened. I actually felt a bit of comfort knowing she was going to be in the delivery room because a doctor I never met was about to deliver my baby. Getting the epidural was not a good experience for me, the weird shock that shot through my legs was strange. Being strapped down was odd. They say when they start the incision you may feel pressure but should not feel pain. I didn't necessarily feel pain or pressure but I was really upset so when they started cutting whatever I felt caused me to start yelling that it felt gross and questioning what they were doing. The anesthesiologist shot me with some anti-anxiety medicine, which I did not consent to unless it was in the paperwork I signed. Once the obstetrician had me cut me open I heard him discussing with the midwife how my baby’s head was already engaged in the birth canal. They had to yank on him to get him out. Around 2:30 AM my boy was out and my husband and I both shed happy tears. I saw them hold him up then take him, my husband followed. I knew my next big job was to not let the c-section get in the way of the breastfeeding relationship I wanted with my child. My husband came into the recovery room with the baby but I wasn’t able to hold him for over an hour because of the anti-anxiety medicine. My husband said my eyes were rolling back in my head and I was still irate, complaining of severe chest pain. I was eventually able to latch my baby on, but as we know, according to nature a mother’s milk doesn’t come in for a day or two. I was met with remarks from the nurses that I needed to supplement. One nurse, in particular, was amazing and helped me pump, work on latch and inquire if the NICU had donor milk to delay supplementing as long as possible. I gave in and he did get a little formula. My midwife came to visit later that day and brought a minky blanket for the baby and a message that I should have c-sections from now on. Honestly, what kind of midwife says that? I learned that not every midwife is created equally. Remember you are paying them for their service and can fire them at any time. My c-section recovery wasn’t terrible. My body was strong and healed well. I have been able to successfully nurse my son for 3+ years. Although the birth didn’t go how I wanted it to, I learned about how important it is to find the right birth team and speak up. Since that birth, I have had an unmedicated, vaginal birth after cesarean (VBAC) at a birth center and it was absolutely empowering.